In your own words, how would you describe DRIME? Tess: It communicates the gospel without words. It transcends language barriers. It tells a story of how Jesus steps into people’s lives of different people struggling with different things and meets them where they are. Everyone’s dressed in black, there’s one guy in a white shirt and he represents Jesus. It’s a ministry and they perform on the streets with music. It’s a different tool for evangelism. You’ve been to ministry time in Benin. If someone’s never seen that, can you describe it for us? Tess: We’re at the beach. It’s a big beach. People going about their business. Some people are sitting. There’s people trying to sell things, walking around. It’s a bit of a slower pace. There’s not people rushing by, just people wandering, taking in the sights. There’s music playing. As DRIME comes together, you see a cluster starts to form. We start playing music and start drawing people’s attention and see heads starting to turn as they sit and watch. As the dramas begin and people begin talking, the little groups start of form on the outside of people sitting. All sorts of different ages. Kids. Elderly people. Teenagers. Every single category. People just kind of sit around and watch. The DRIME team spreads out in the crowd and you look all across the horizon of the beach and you can see little clusters of people standing and talking. Everywhere there was a group of people there was a DRIME team member having a conversation and pointing towards the dramas and you’ll see all different facial expressions. curiosity. Near the end of the time, you see people huddled together, praying together. And then [there is] calling people forward who want to make a decision. 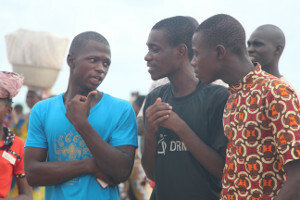 The Benin DRIME team circles around them and prays for them, shares the gospel with them. And then there’s a team huddle and story-telling at the end. What are the DRIME team performing? What would you call that? T: I call it a drama. What does it look like? Actually you’ve done it too. T: I have! It’s a mix between a dance and a drama. It’s choreographed. It’s such a unique thing, it’s hard to come up with like a word to describe it. I see it as a bit of a dance, a performance.. but it’s more than that. I think the story actually is the defining part of it. Dance is more just random movements, but DRIME – it tells a story. Click here to see more pictures from that trip to Benin.